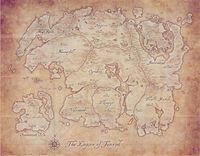 Tamriel is the vast continent where the events of the Elder Scrolls occur. For much of its history, it has consisted of nine provinces: Black Marsh, Cyrodiil, Elsweyr, Hammerfell, High Rock, Morrowind, Skyrim, Summerset Isles, and Valenwood. Tamriel is located on a planet called Nirn in the realm of Mundus, together with the continents of Akavir, Atmora, Yokuda, and Pyandonea. Aldmeris and Lyg are other continents that do not have solid evidence for their physical existence. The Eltheric Ocean lies west of Tamriel and the Padomaic Ocean surrounds the remainder. Islands of note that are not usually considered part of any continent include Cathnoquey, Esroniet, Roscrea, Thras, and Yneslea. Beyond Mundus, the Aurbis contains numerous Planes of Existence including the 'outer realms' of Aetherius and Oblivion, and the infinite Void. Black Marsh — A huge and mostly uncharted region of densely vegetated wetlands at the southeastern tip of Tamriel. The reptilian Argonians thrive in these foreboding swamps. Cyrodiil — Also known as the Imperial Province, it lies in the central-south part of Tamriel and it's the home of a humanoid race known as the Imperials. The center of their Empire and seat of governance, Cyrodiil is also known as "the Heartland". Elsweyr — Divided across arid badlands to the north and a more populous sub-tropical zone in the south, this region marks the southern coast of Tamriel. Elsweyr is home to the cat-like Khajiit. Hammerfell — Lying in western Tamriel, this province is dominated by the Alik'r desert. Hammerfell is inhabited by the human race Redguards. High Rock — Home to the Bretons, this province is divided into multiple Breton city states and minor kingdoms. It is a temperate coastal region in northwestern Tamriel. Morrowind — The province in the northeast corner of Tamriel is home to the Dunmer (Dark Elves). It consists of a continental mainland and a large island in the center called Vvardenfell, separated by an inlet from the Sea of Ghosts. Skyrim — This is the most northern province of Tamriel and it is inhabited by a human race called Nords. It is a cold and mountainous region. Summerset Isles — A province in southwestern Tamriel consisting of fourteen islands of varying size. The Isles are the homeland of the Altmer (High Elves). Valenwood — The densely forested, sub-tropical region that forms the southwest coastal plain of Tamriel. Valenwood is home to the Bosmer (Wood Elves) and Imga.